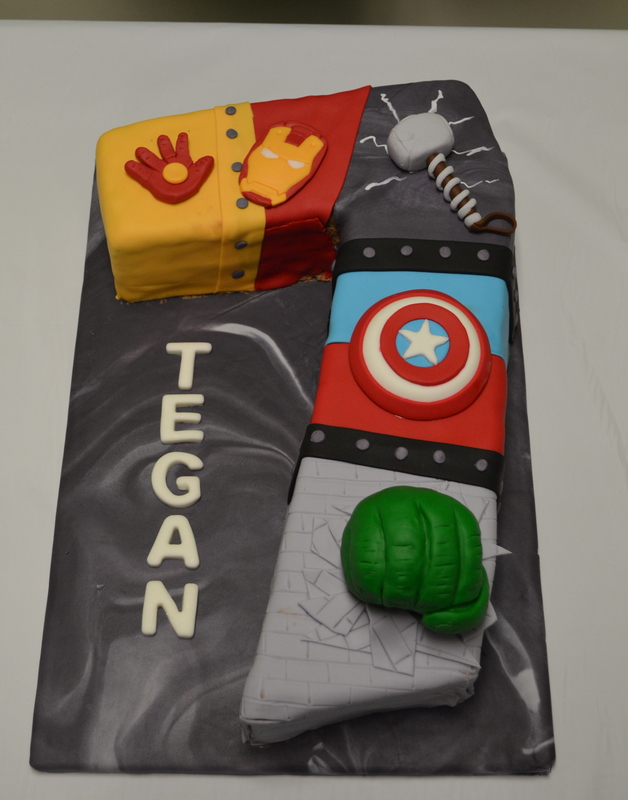 I just finished making my nephew an Avengers cake for his 7th birthday. I saw a few different examples on Pinterest and took a few ideas from them. First I started off with the Hulk’s hand. 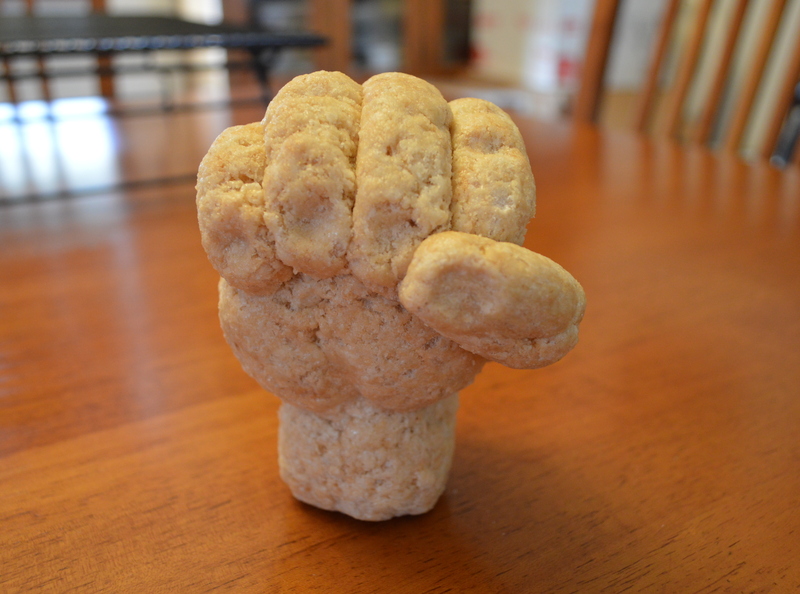 I made it out of Rice Krispie treats and it wasn’t nearly as difficult as I thought. It was still a bit lumpy but I was hoping modeling chocolate would smooth out the roughness. I’ve never made nor used modeling chocolate, but found instructions and went to work. It wasn’t a huge success. It didn’t firm up enough so I had some sticky glop that looked like flubber (I used green candy melts). I managed to smooth enough on to get rid of the major bumps and holes, but hey it’s Hulk, he’s not going to have soft, silky skin. Next up was Captain America’s shield. 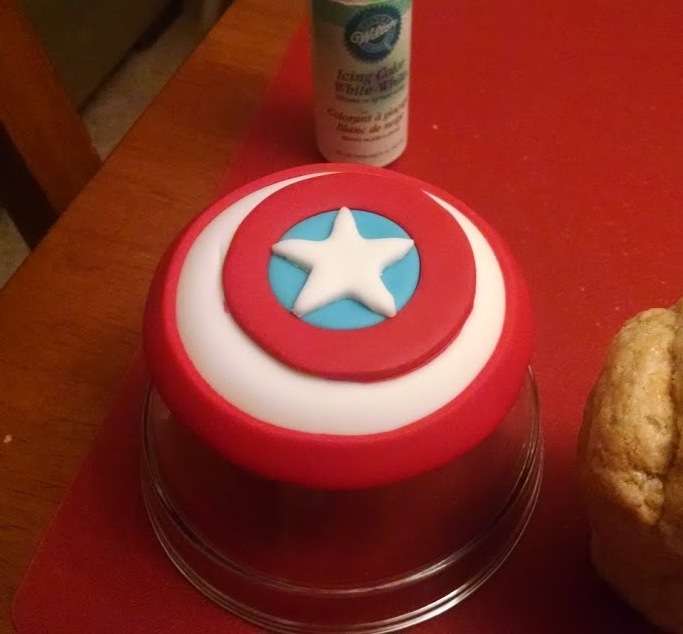 The shield on the cake I saw was just flat fondant and I wanted to give it a little more shape so draped it over a small glass bowl to give it a bit of curve. I used some circle cutters and a star cookie cutter to get the shape. I made the shield in white and then placed everything else over it. Easy peasy compared to Hulk! Thor’s hammer was next. I actually pulled up a picture of his hammer in the movie and tried my best to copy it. I used a mixture of gum paste and fondant for this one so the hammer head would dry up more quickly. I would have liked to make the “silver” wrapping around the handle thinner but the fondant was just drying and cracking so fast I just needed to get it on. Finally Ironman. 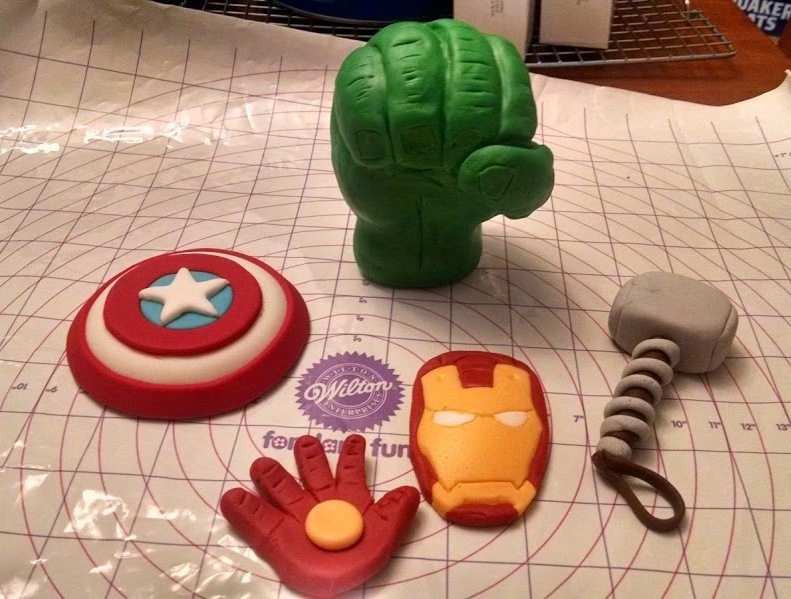 Once again the example I saw was a couple of flat pieces of fondant that were ok, but I wanted it to look better. First I had to sketch out his mask to make a template. Using an exacto knife I carefully cut out the mask and used it to cut out the red part of the mask. Then carefully cut out the gold part of the template. I used this to cut out the gold part in the red fondant mask I cut out first, then used the template to cut out the gold mask. Once that was cut out I could pop the gold part of mask into the space in the red part of the mask. Now I had a mask that was one piece. I also wanted a bit of shape to the mask so placed it in a small, shallow bowl face down. I didn’t actually use this bowl to form his face, I just wanted to use it for the picture. 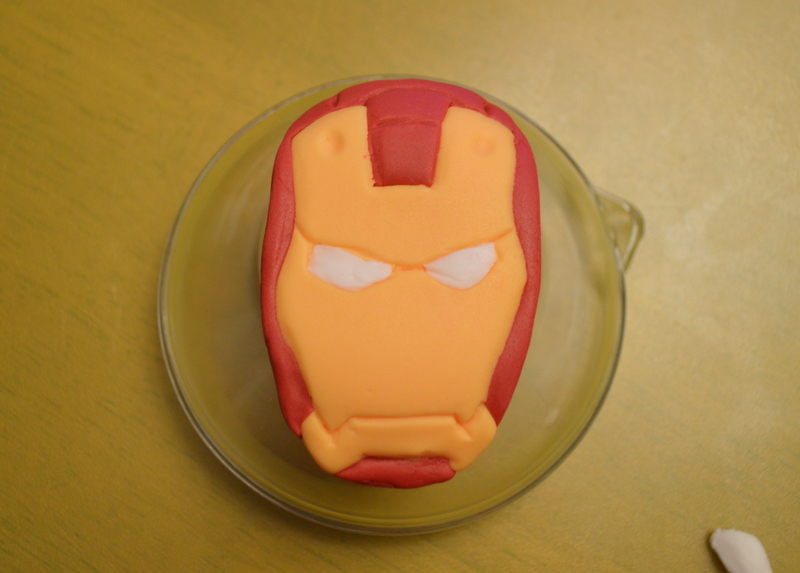 While the fondant was still soft I used a fondant tool to draw the lines on his face. I also took a small bit of white fondant and smoothed it in to the eyes to create his “glowing” eyes. 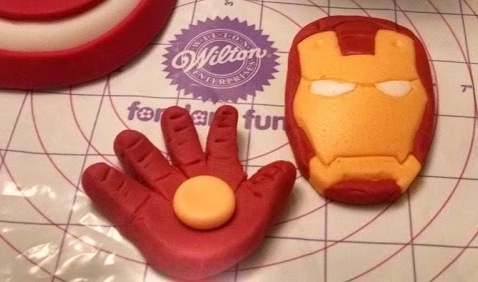 I also decided I needed to make Ironman’s hand as well. I simply rolled out a small circle of fondant and cut slits to make 4 fingers and the thumb and then shaped them to look like fingers. Added a few lines and a small gold circle and he was done. I also used a shallow bowl to shape the hand a bit. I like a bit of dimension, not flat pieces. I decided to cover the cake board in fondant instead of paper. I combined some white and black to give it a marbled look. Next it was the cake itself. Two large half sheet pans, one white and one chocolate. I used chocolate buttercream for the filling. Once I had the cake layered I threw it in our freezer to get it firmed up a bit before carving out the 7. Trust me! Freeze your cake for an hour or two before carving. It makes a huge difference. You don’t want to freeze it all the way through and as hard as a rock, you’ll never be able to get a knife through it. I froze it just enough that the knife cut right through the cake without leaving any crumbs. It was fantastic. I left the cake on a working cake board so I didn’t mess up the fondant. Lesson learned here! I should have cut the board to the shape of the cake before starting to decorate. It was a headache to move from the working board to the fondant covered board. I probably knew this in the back of my mind but for some reason didn’t even think of it. 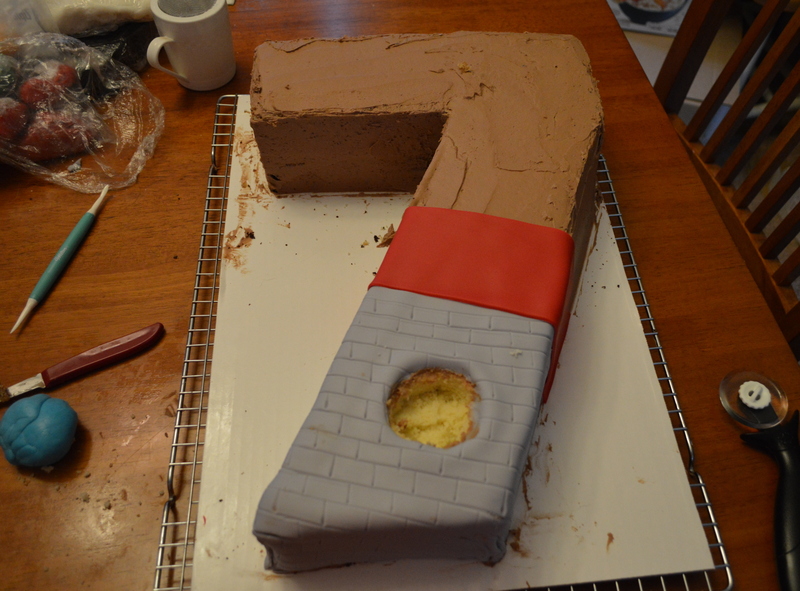 I’ll admit the 7 got a little twisted when I moved it and it was difficult to fix it on the fondant board. But it’s all good, it didn’t look too terrible. 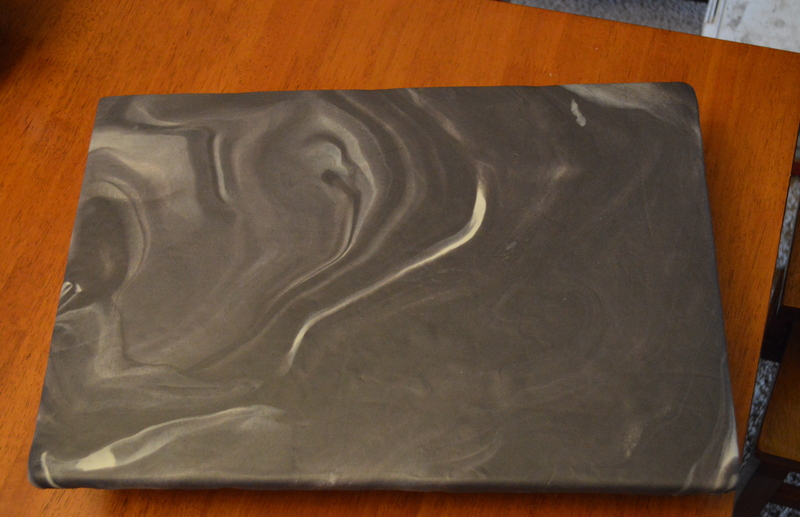 I made a gray “wall” from fondant, but in hindsight I should have created the “wall” after I draped the fondant. I had several tears and was not happy with it. 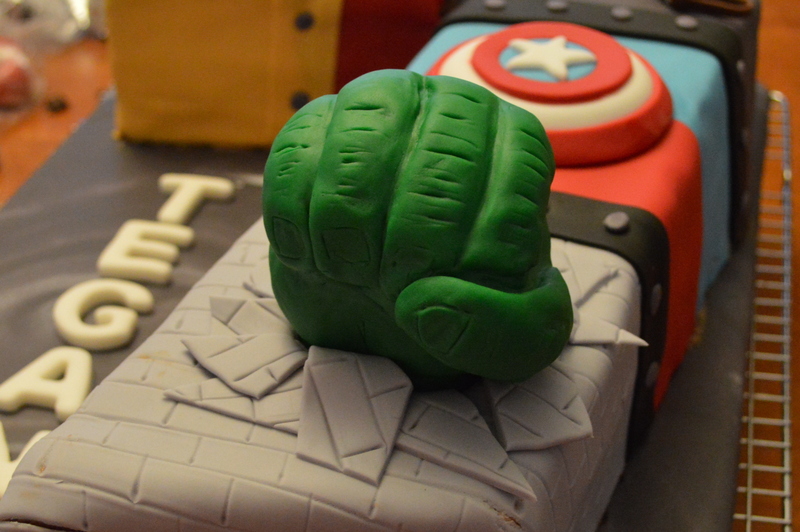 I carefully cut a hole in the fondant once it was on the cake and also cut out some of the cake so Hulk’s hand could sit in there nice and neat. I also made sure to make another fondant wall and cut it into shards to place around his hand to make it look like it just came through the wall. For the rest of the cake I simply put down fondant in corresponding colors. Let me tell you it isn’t easy working fondant into some of those angles. Some of it, I’ll admit, looks pretty bad and lumpy. I think my biggest problem is I tend to roll the fondant too thin or too thick. I haven’t figured out the right thickness yet. I didn’t like how abrupt the color changes were so added some black strips with gray circles, sort of like warrior arm bands or something. One of the cakes I saw was extremely creative with the character changes in the cake, I simply didn’t have time to play around with ideas. 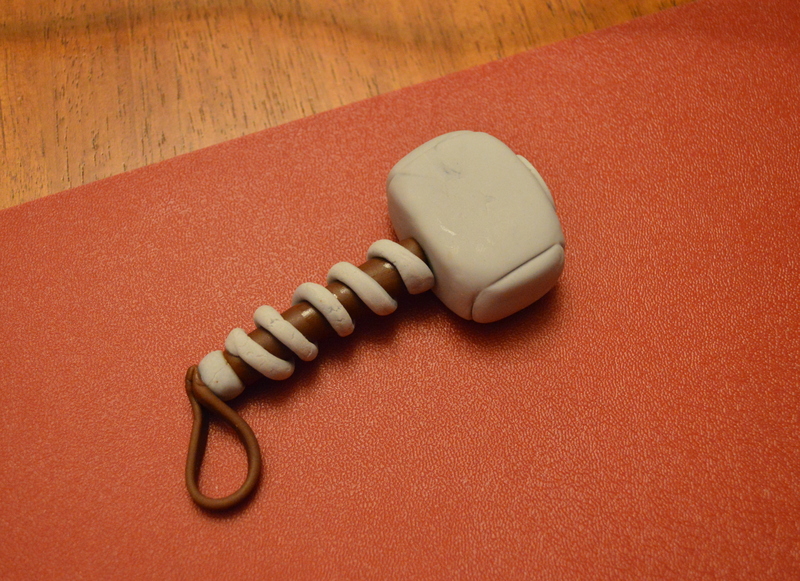 I painted some “lightening” with white food coloring on Thor’s section before placing his hammer. 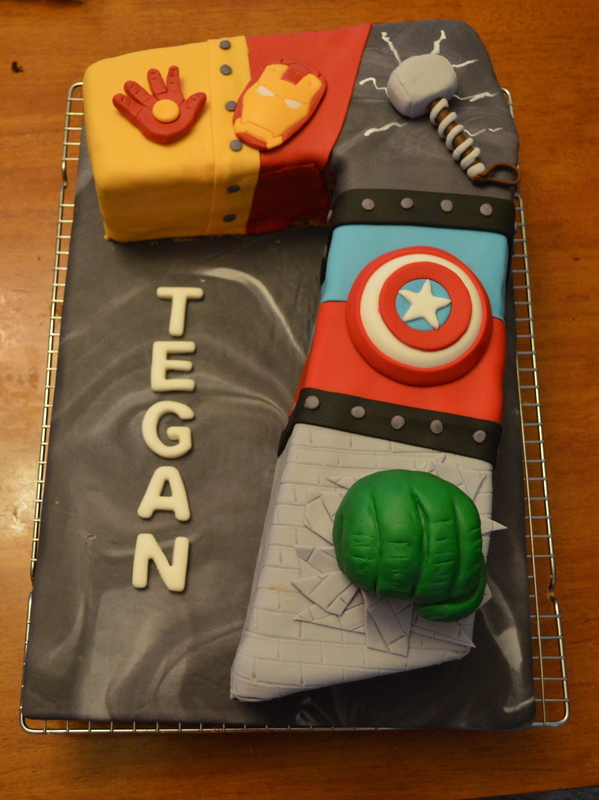 So there it is, my Avenger’s cake. My nephew wasn’t that impressed unfortunately, it didn’t have Ultron.